The most powerful spreadsheet program that will make your assignments a breeze with built-in and customizable functions. Excel is great for measuring personal and academic metrics. 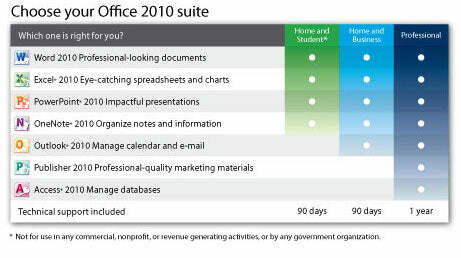 Microsoft Office Home and Student 2010 edition includes four of the most popular applications: Word, Excel, PowerPoint and OneNote. The user-friendly software suite is designed to deliver outstanding performance and flexibility for a variety of users. The 2010 edition is new and improved with features like photo editing tools in Word, better data charts via Sparklines in Excel and a user-friendly broadcasting tool called Broadcast Slide Show in PowerPoint. The software also comes pre-loaded with attractive, ready-made templates that will save you time and frustration when putting together reports, presentations and more. Each Microsoft Home Office and Student 2010 download comes with one PC license. The 25-character product keycard is delivered by email from My Choice Software. This single-computer license is ideal for customers with newer PCs that don't need to upgrade other home computers. The PC license is for Windows machines only. Please note that the download license is for a permanent (not trial) copy of the software and cannot be transferred to another computer once installed. Installation is guaranteed, or your money back. If you have trouble downloading the software, a support team is available to assist you. Tried to download program, was not able. Were not as instructions. Wil contact you today and try again. Just as advertised...product install worked after download without a hitch. Tech support was great...as we missed the allocated download window due to having a very busy day. Support resent the download e-mail the next day as soon as we called. It's a great working tool, easy to use. This version of the 2010 Microsoft Office Home and Student is great. More simple to use than the previous versions. Purchase and installation went smooth. I had to order this so I could. Edit my document. I got a new computer with Windows 10 and could no longer edit my documents. This product worked great. Easy to install and great customer support.